“The release of greenhouse gases resulting from thawing Arctic permafrost could have catastrophic global consequences,” said Dr. Max Holmes, a Senior Scientist at the Woods Hole Research Center (WHRC). 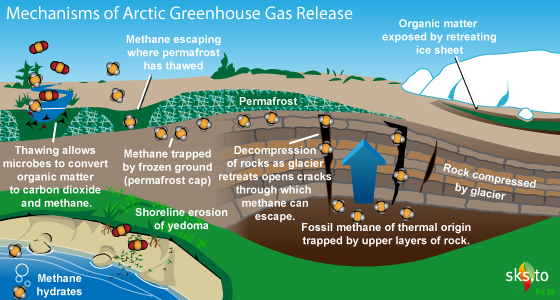 Thawing permafrost releases greenhouse gases (carbon dioxide and methane) into the atmosphere, which accelerate climate change, which in turn cause more thawing of the permafrost. This may be a fairly slow process, and there is a lot more research to be done in this area. Some scientists fear that this potentially unstoppable and self-reinforcing cycle could produce a dangerous "tipping point".